Quick thinking by the residents of a house in the Thorofare section saved many belongings from becoming damaged by fire. During the early evening hours, District 6 was alerted to the Thorofare section for a reported dwelling fire. While responding to the scene, Gloucester County Communications advised units of smoke detectors sounding and smoke coming from the back bedroom. Assistant Chief 6102 arrived on location followed closely by Engine 614 with nothing showing from the exterior. The crew of 614 made entry and were faced with a heavy smoke condition on the second floor. After searching each room and securing the doors closed, 614s crew located a small contents fire in a back bedroom. The fire was extinguished with a water can and ventilation began. During the investigation, it was known that the residents of the house found smoke coming from the room and immediately closed the door keeping the fire contained to one room. Closing the door to the room and with windows closed reduced the amount of oxygen to fuel the fire and stopping any rapid fire spread. If you ever have a fire in your house, if able, make sure all of the doors to the rooms are closed and the door is closed when you exit the house. 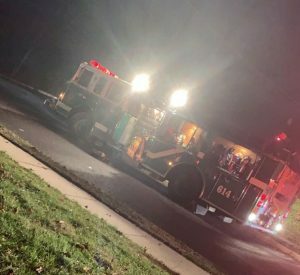 Units responded consisted of Assistant Chief 6102, Engine 614, Engine 632, Chief 6201, Engine 613, Ladder 666, Chief 6601, Ladder 626 and Gloucester County EMS. The cause of the fire is under investigation by the West Deptford and Woodbury Fire Marshals.